Thanks to the generosity of friends from work and the mini-orchard at their house, I have had many pounds of small, sweet apricots to play with over the past few weeks. I assume they are Blenheims, the magical, highly desired variety you never see in stores, because of both their size and the intensity of their flavor. Blenheims by the bushel - I am one lucky girl. I've stuffed apricots with goat cheese, made easy apricot jam, and joined them with cherries for apricot clafoutis. But what my husband really likes is pie. I took some puff pastry out of the freezer last weekend and made these beautiful apricot turnovers for him. Are you wondering why I used frozen puff pastry when you know I conquered my fear of pie crust when I made that rustic cherry pie a few weeks ago? Because it was there, that's why. And it's so easy. Sprinkle some flour on your countertop and roll out one sheet of the puff pastry dough until it's thin and roughly a 12-inch square. I say "roughly" because, trust me, mine was quite rhomboid. If you like to be exact, you can measure and trim and all that. Me, I prefer to live dangerously. Now cut the dough into four more or less equal square. Spoon a small amount of the apricot mixture into the center of one square, then fold over the corner to enclose the filling and make a triangle. 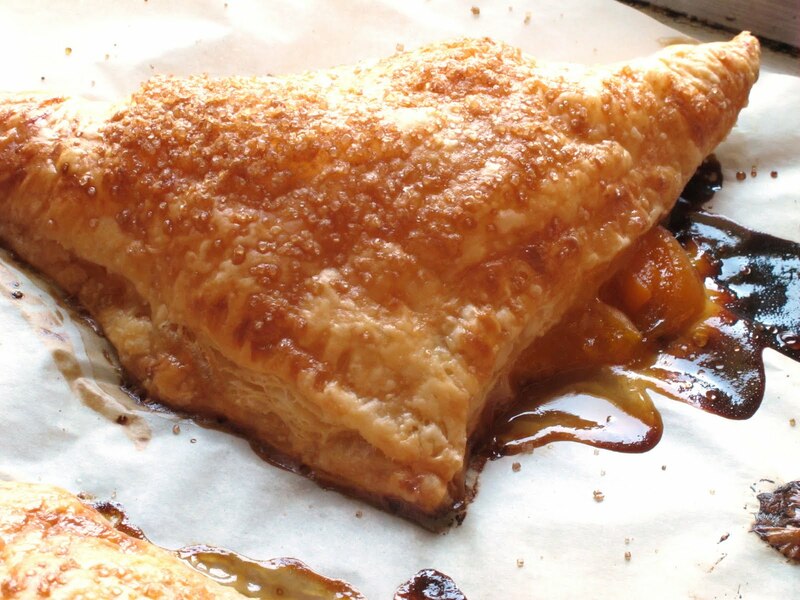 Don't use too much of the filling or it will leak out when you bake the turnovers. Why yes, I did learn that one the hard way - so glad you asked. Carefully move the turnover to a baking sheet lined with parchment paper. Repeat with the remaining rolled-out squares, then with the other sheet of puff pastry dough. You will have 8 turnovers in all. I used two baking sheets, but you might be able to squeeze your turnovers onto one - they won't spread, so you can bake them close together on the sheet. Pinch the edges closed with your fingers, then use the tines of a fork to press the seams closed. Coincidentally, using a fork on the turnovers this way leaves a lovely pattern along the edges, which almost makes the pastries look professional. Beat the egg and milk or cream together in a small bowl, then brush the turnover with the egg mixture - this will help it bake up brown and glossy. Sprinkle with a little more of the raw sugar, poke a few holes in the tops with your fork, and slide the turnovers into the oven. Bake the turnovers about 20 minutes, until they are nicely browned and you can see the juices escaping from the flaky pastry shells. (That's inevitable, no matter how well you sealed your turnovers.) Cool on the baking sheet. Serve warm or at room temperature. 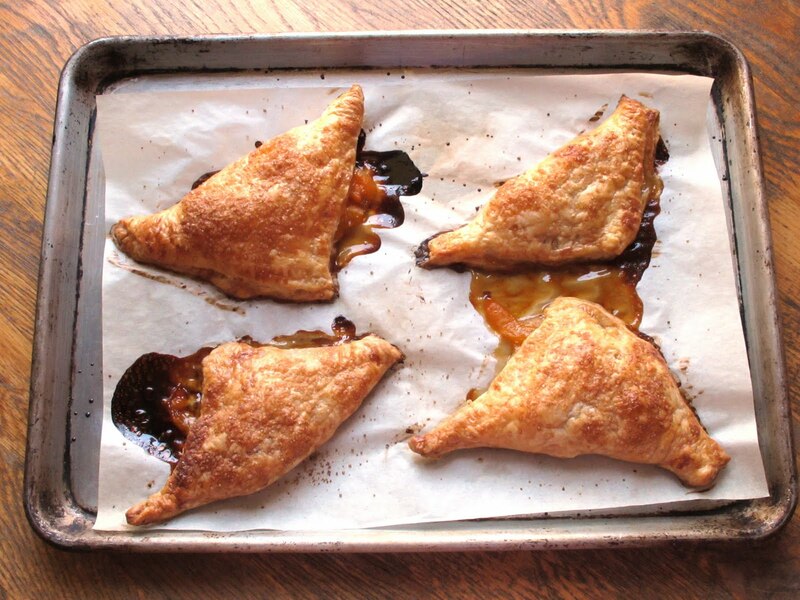 These turnovers are best on the day they're baked; if you're serving them the next day, warm them in the oven for a few minutes before serving to crisp the outsides. I agree with your husband...nothing beats pie! This is by far my favorite recipe I've seen this week. I wish I had an apricot tree near my house...very jealous of these beauties! Ohh, you are making SUCH good use of those apricots, girl! Mmm. I passed some in the grocery today and considered, but had already spent my recipe budget for the week. Next week!?! ?